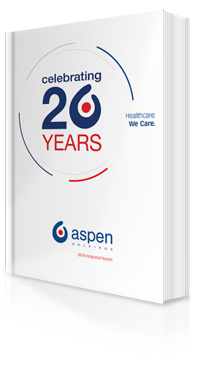 The Summarised Group Annual Financial Statements of Aspen Pharmacare Holdings Limited, set out on pages 122 to 135 of the Integrated Report, which comprise the Summarised Group statement of financial position as at 30 June 2018, and the summarised Group statement of comprehensive income, changes in equity and cash flows for the year then ended, and related notes, are derived from the audited Annual Financial Statements of Aspen Pharmacare Holdings for the year ended 30 June 2018. In our opinion, the accompanying Summarised Group Annual Financial Statements are consistent, in all material respects, with the audited Group Annual Financial Statements, in accordance with the JSE Limited's (JSE) requirements for summary financial statements, Basis of Preparation and Accounting Policies to the Summarised Group Financial Statements, and the requirements of the Companies Act of South Africa as applicable to summary financial statements. The Summarised Group Annual Financial Statements do not contain all the disclosures required by International Financial Reporting Standards and the requirements of the Companies Act of South Africa as applicable to annual financial statements. Reading the Summarised Group Annual Financial Statements and the auditor's report thereon, therefore, is not a substitute for reading the audited Annual Financial Statements and the auditor's report thereon. We expressed an unmodified audit opinion on the audited Group Annual Financial Statements in our report dated 26 October 2018. That report also includes communication of key audit matters. Key audit matters are those matters that, in our professional judgement, were of most significance in our audit of the Group Annual Financial Statements of the current period. The directors are responsible for the preparation of the Summarised Group Annual Financial Statements in accordance with the JSE's requirements for summary financial statements, set out in Basis of Preparation and Accounting Policies to the Summarised Group Annual Financial Statements, and the requirements of the Companies Act of South Africa as applicable to summary financial statements. Our responsibility is to express an opinion on whether the Summarised Group Annual Financial Statements are consistent, in all material respects, with the audited Group Annual Financial Statements based on our procedures, which were conducted in accordance with International Standard on Auditing (ISA) 810 (Revised), Engagements to Report on Summary Financial Statements.